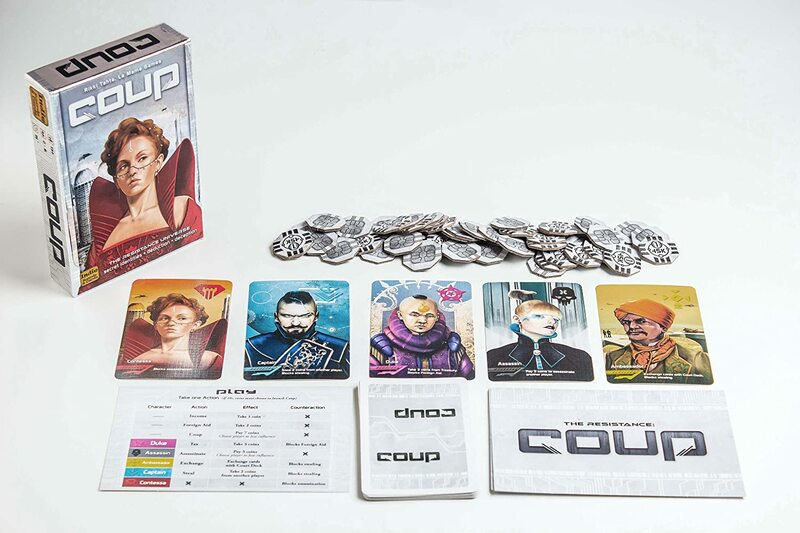 Coup is a game by Rikki Tahta and is a fast-paced game easily played within the span of 10 minutes. Up to six players can partake in this backstabbing pit of lies and deceit, though I’ve personally found that four feels like it’s the magic number of players. Any more than that just feels crowded, and certain mechanics of the game feel like they start to break down with five or more people partaking in the deceit (more on this later). To start the game, each player receives two coins as their starting budget. Each draws two cards from the shuffled deck of character cards. This is that players “Court” of nobles. There are three copies of five characters in this deck, and players would be well-advised to keep a mental count in their head. Just part of the price of holding power. Each player’s court composition is always kept secret. However, the benefits provided by individual court members are not. Each character has a particular ability he or she provides to the player’s court. For example, the Captain has the ability to steal coins from other players, while the Duke is able to take three coins from the reserve every turn. Some court members block the abilities of others. For example, the Ambassador can prevent the Captain from stealing coins while Contessa can prevent an assassination. By performing any of these actions or counter-actions during their turn, players insinuate that they have the relevant count member in their possession. A player never has to say he has a specific member in his court; he or she simply needs to declare what action is being taken. A player will be judged by his actions every turn, so pay attention to what’s being done and what’s being said. Let’s make an example. A sample turn for a player… we’ll call him Sir George… could be as simple as taking three coins from the Treasury. By doing so, Sir George is insinuating that he has the Duke in his court, as no other character grants that particular ability. Sir George never says he has the Duke, he merely declares that for his turn he will be taking three coins. Next up is Lady Grace. For her turn, she declares that Sir George has become a nuisance and must be dealt with. She pays three coins to the Treasury and declares that an assassin has been sent after Sir George. Again, she never explicitly declares she has the assassin; Lady Grace simply declares what action is being taken. Hoping to form a temporary alliance, player three… let’s say, Sir Thomas… interrupts play by saying that the assassination has been foiled. By doing so, Sir Thomas insinuates that he has Contessa in his court and is preventing Sir George from being assassinated. Of course, everything done above may have been a lie. It happens a lot in this game. It’s the nature of the beast. A player might take three coins as part of his Dukely actions… but that doesn’t mean he actually has the Duke. That player is only stopped if he is challenged; otherwise, whatever action he claims is taking place occurs as stated. Any action a player takes on his court’s behalf is subject to challenge. If another player suspects that Sir George is lying through his teeth about having the Duke on his side, he may call Sir George out. Doing so is a free action that can be taken even if it’s not your turn. But the consequences are never free. Anyone may issue a challenge, but beware! Failing a challenge from either side – either as the one being challenged or the one issuing the challenge – results in the immediate assassination of one member of your court. That member is revealed and turned face-up immediately. He or she no longer contributes any abilities for the remainder of the game. Lose both members of your court, and you’re done. You only get those two chances. Going back to our earlier example, let’s say that Lady Grace believes Sir Thomas is lying. She doesn’t believe he has Contessa in his court. She issues a challenge to Sir Thomas, and it now falls upon Sir Thomas to prove that he does, indeed, have Contessa in his court. If he does, Lady Grace’s challenge fails, and she must lose a member of her court. Sir Thomas cycles Contessa back into the draw deck and draws a new member of his court, and play continues. However, if he didn’t have Contessa, Sir Thomas fails the challenge. He immediately chooses one of his two court members for execution, and he is halfway to losing the game. 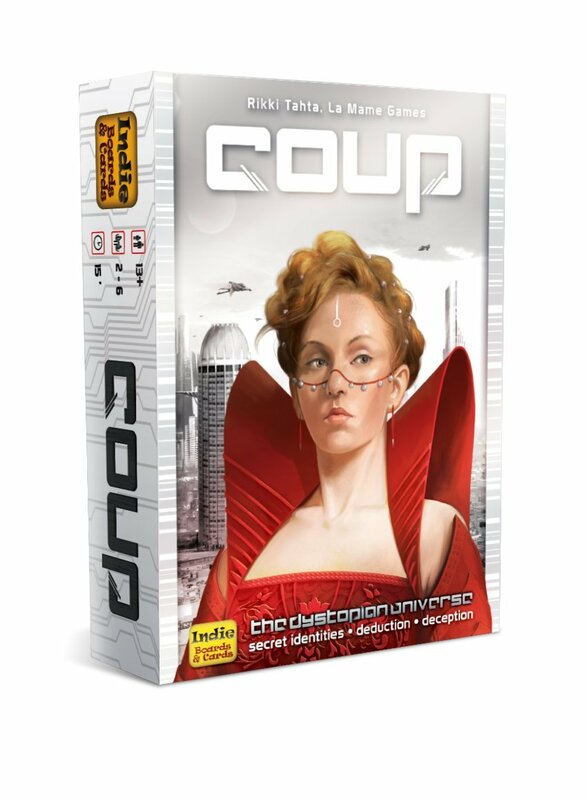 One last bit of business is the very namesake of this game – the coup. I mentioned coins earlier. They have a purpose. One use is to fund assassins, sure. But on their turn, players may initiate a coup against any other player for seven coins. If ever a player reaches ten or more coins, he is required to initiate a coup. If a player has a coup launched against him or her, he or she immediately loses a court member. Nothing can block it. Nothing can save that court member. Nothing can stop a coup if it’s properly paid for. A court member simply dies. Play in Coup is fast. Really fast. Actions are taken with little fanfare as players slowly build their coin collection up to that dangerous number. That is, until the BS starts to fly and accusations run rampant. And then, Coup just gets wild. Alliances are formed and swiftly broken. Assassinations are started and prevented, and the unstoppable juggernauts that are coups break players in half or banish them from the game entirely. It’s incredibly fun to watch, and a riot to play. The game isn’t completely without faults. The Ambassador felt like an afterthought and is a completely disposable class. His counter-ability is even duplicated by the Captain, making him borderline irrelevant for most of the game. The coins themselves are simple cardboard counters, and a little underwhelming. The rulebook is adequate, but lacks meaningful examples of play until the final page. These are nit-picks, but a better rulebook and some plastic mold tokens might have gone a long way (though, arguably, it might have pushed the price of this game beyond the self-imposed limit for this Budget Bucket series!). Still, despite these minor qualms, it’s hard not to give an immediate recommendation to Coup. Play is extremely quick and satisfying. Different play strategies are rewarded by the confused, conflicted looks on your opponents’ faces. One of my favorite games involved me as a borderline suicide bomber. The Duke is a popular figure in our games, to the point where there were once four supposed Dukes in play. Starting the game after, I decided to immediately call out the first player to pretend to have the Duke. I was rewarded by his annoyed look and the quick flip of a member of his court. So that’s Coup. Try this game. 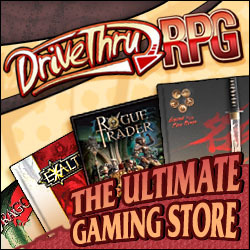 It’s fast enough and deep enough to have a permanent place at your game-day table. Its simple rules are easy enough to bring on newcomers, yet the deception strategies run deep enough that no game ever feels the same. So sit down. Draw your court. Count your coin. And start telling lies. A great game for those that like to lie and cheat their way to success!